​What's wrong with the current sign? The Dynamic Symbol is an improvement to the old in major ways: (i) the person in the new image is more defined than the one in the old image, and (ii) the new image shows movement, a symbolic action that emphasizes differing abilities, and this reframes the way society views and interacts with persons with a disability. The change in symbol has also served as a medium to have conversations about accessibility and disability rights in the province; the catalyst for a much needed culture shift on these issues. The International Symbol of Access was popularized by the Swedish Handicap Institute in 1969. The sign has become internationally accepted as the means of indicating places that are barrier-free. In 2013, Brian Glenney and Sarah Henderson, looking to create a more up-to-date accessible icon, developed the Dynamic Symbol of Access, and co-founded the Accessible Icon Project (AIP) . But the AIP isn't the first effort at changing language and imagery surrounding people with disabilities. 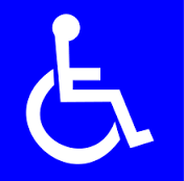 The term “handicap” was once the common way of referring to a person with a disability. But this term comes from a bygone age when people with a disability were forced to be beggars, holding their hand-in-cap. Our society has come a long way since then, and using the term handicap has become unacceptable—and even illegal in places such as New York. Changing the Accessible Icon, like changing the language we use to refer to people with a disability, frames the way our society views disability. That's why the Forward Movement wants Ontario to legislate the updated icon. But the new symbol doesn't represent me either! Disabilities come in many different forms, making it difficult to find a symbol that speaks to everyone's personal needs. Ideally, we'd love to create a more representative symbol. But the International Symbol of Access serves of a purpose of indicating barrier-free access. A radical change would create a long period of confusions, where people would be able to find what is accessible. What are the current laws in Ontario? Why is the new symbol an improvement? ​The Dynamic Symbol is an improvement to the old in major ways: (i) the person in the new image is more defined than the one in the old image, and (ii) the new image shows movement, a symbolic action that emphasizes differing abilities, and this reframes the way society views and interacts with persons with a disability. The change in symbol has also served as a medium to have conversations about accessibility and disability rights in the province; the catalyst for a much needed culture shift on these issues. HOW MUCH WILL IT COST TO CHANGE ALL THE SIGNS? What's CHANGING A SYMBOL GOING TO DO? The Forward Movement is using the change in symbol as a platform for education. If an establishment quitely started using the Dynamic Symbol tomorrow, only half of our battle would be won. When organzations and companies choose to use the Dynamic Symbol, it is important from them to understand and promote why. This has led us to making the changing of pavement accessibility signs a painting event, where conversations can be had about representation of people with disabilites. If companies decide to use the Dynamic Symbol, it is important for them to let their employees and customers know why they have opted for this change. The change is being used as an announcement of an institutions commitment to being accessibile and inclusive. The new symbol is meant to spark conversations that educate Canadians about the importance of removing barriers—both physical and cultural—to make Ontario more accessible and inclusive for everyone. See some of those conversations here.